Since 1914, the Junior League of Kansas City, Missouri, has been making a difference in the Kansas City community, working with more than 350 community agency partners and donating $17 million and more than 2.4 million volunteer hours. Annually we provide approximately 15,000 volunteer hours to both community organizations through our Community Volunteers & Grants (CV&G) program, and to programs designed by the League for the community, our Signature Programs. JLKCMO members research areas of need in the community and educate our membership about those issues. Our current Signature Programming focus is Women and Children, focusing on the areas of abuse and neglect, childhood development and women’s self-sustainability. Our current Signature Programming focus is Women and Children, focusing on the areas of abuse and neglect, childhood development and women’s self-sustainability. 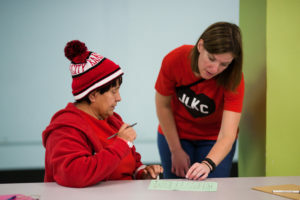 In addition to our Signature Programming and CV&G programs, the JLKCMO Action Team offers our trained volunteers to Kansas City area nonprofit organizations for short-term assistance for events and projects. And our Community Endowment Fund awards grants to community agencies in response to critical needs.